I'm off to visit Urban Craft Uprising this weekend, but in the meantime, I'll leave you this hot Friday with some pantone inspiration! I have to admit that my last visit to Brussels wasn't exactly filled with fun times. However, I do plan on returning one day and one hotel to consider is the new Pantone hotel in the City's Sint-Gillis area. 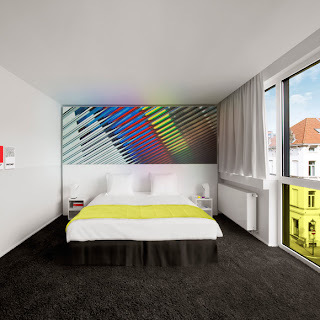 Created by Architect Olivier Hannaert and Interior Designer Michel Penneman, the 59 room hotel is a collaboration between the Pantone Global Colour Authority and British developers. Built on a white canvas, the Pantone Hotel provides clean space for saturated colours to pop. Each of the seven floors showcase different colour palettes to complement guests' emotions while the rooms are patterned after one of seven distinct pantone colours. Visit their website for more details or to plan your next European holiday!